Control of it is good. We live in an age where, more and more, we expect instant results. We lead busy lives and want faster broadband, quick service and next day delivery. It is hard to believe that ‘self-control’ or ‘control of the mind’ can really bring happiness. Spontaneity is all, regardless of whether the thing we want to do is objectively good for us or not. But if we look around us, it is not hard to see the suffering that can be caused when people surrender to all their impulses. There is a tendency now to see ourselves as passive creatures, helpless in the face of urges such as desire or anger. How often do we hear (or find ourselves saying) things like: ‘He made me so angry, I said something I regretted’? But the anger is not ‘out there’, it has arisen in ourselves. Perhaps the other person did do something wrong, but we chose to act upon our anger. Reacting in a different way – from calmness and strength – might have resolved the situation in a better way, leaving less regret behind. The problem is that impulses like anger, greed, fear, hatred etc arise so quickly that they can take control of our minds before we even see them coming. Meditation is a useful tool here because it brings insight into what is happening, almost seeming to slow the process down, so we can catch the impulses as (or even before) they arise. The insight allows us to take a degree of control over the impulses, rather than be swept away by them. Meditation also helps us to develop more wholesome mental states, such as calmness, kindness, and wisdom. These states are natural to us, but they become overridden by habit and conditioning. Once we are able to turn away from distractions, we will find a peace and strength that we may have lost sight of over the years. Then when, as is bound to happen in this world, we are faced with difficult situations or people, we will begin to respond with wisdom and compassion rather than anger, envy, or fear. As the verse tells us, finding this kind of control is not always easy, and it may go against decades of habit, and the values of society around us. But if we can find it, it will bring genuine happiness, regardless of our circumstances, deeper and more lasting than can be afforded by any technology or fashion. For Vesakh 2016 CE/2599 BE, I have posted under ‘Verses’ a translation of the Karaṇīya Metta Sutta, which many of us chant regularly, but perhaps don’t always think about what it means. It describes the way to practise Mettā, or loving kindness to all beings. The translation, though fairly literal, is in modern, everyday language. It’s the one I included in the Order of Service for my husband’s funeral in 2012, because I wanted everyone present to be able to understand it, even if they were new to the Buddha’s teaching. It will be seen that the love described in this sutta is not something soft or woolly, but a state of great strength and clarity that forms an intrinsic part of practice on the Buddha’s path. May all beings be well. May all beings be happy. 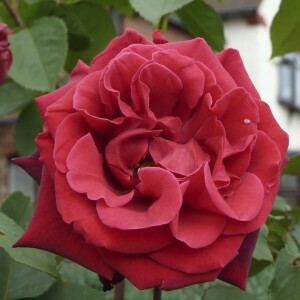 Today, walking to the shops on a hot sunny morning, I saw a beautiful rose-bush in a garden. The owner of the garden saw me enjoying the scent, and we both agreed that we liked the old, sweet-scented varieties of roses the best. And those verses from the ‘Flowers’ chapter of the Dhammapada came to mind. Valerie’s article, Dhammapada, Dharmapada and Udānavarga: The Many Lives of a Buddhist Text, was published in the following edition of the same journal, which is now available and can be ordered here. You shall not build a house again. Has reached the end of cravings. On May 5th or 6th this year (depending on which day the full moon falls in their particular part of the world), many Buddhists will be celebrating the festival of Vesākha (Vesakh, Vaiśākha), which marks three great events in the life of the Buddha: his birth; his attainment of Buddhahood; and his Parinibbāna (when he passed away, never to be born again). These Dhammapada verses are said to have been spoken by the Buddha on his attainment of Enlightenment under the Bodhi Tree. They are addressed to Māra, who embodies the forces that seek to keep us bound to the conditioned realm, saṃsāra. Māra is the house-builder, who has built all the bodies in which the Buddha-to-be has travelled in his ‘journey of many births’. Now the Buddha has recognised him, and Māra will no longer have any hold over him. When the Buddha saw this, and decided to teach others, he showed the way for any of us who wish to make an end of that painful journey, and become free from conditioned things. However overwhelmed we may sometimes feel by the difficulties of our lives, and the obstacles in the way of our practice, we should never forget that freedom is possible, and that there is a way to reach it. Will do worse to you than that. Will do better for you than that. A Dhammapada thought for a time when we are inclined to dismiss those who have made mistakes, and deny the value of second chances!